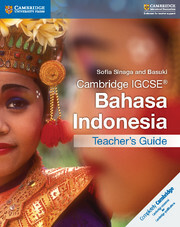 Offering comprehensive support for the Cambridge IGCSE® Bahasa Indonesia syllabus, this Teacher’s Guide contains expert planning and teaching support. It also offers guidance on applying assessment criteria to ensure effective delivery of the course and coverage of all skills and learning outcomes. Packed with teaching ideas and additional differentiated resources to suit every level. Comes with comprehensive answers to exercises in the coursebook. Includes support in understanding how the assessment criteria can be applied to students’ work and learning path. Includes strategies for improving core skills and motivating every student. Unit 3. Berbicara dan Merespons.